Cyrus Currier and Sons built the presses that Currier & Ives (in NYC) used for the images on this web site. Cyrus Currier settled in New Jersey in about the year 1835, residing first in Livingston and later in Newark. He soon secured employment at the shops conducted by Seth Boyden, one of America’s leading inventors. There, Cyrus Currier, and excellent workman, helped in the construction of the first two outside connecting-rod locomotives ever built. They were for the Morris & Essex and Orange & Essex Railroads. In March, 1842, Cyrus Currier had acquired ability and capital enough to establish a plant known as Currier, Davis and Jacobus. He specialized, at first, in paper making machinery, and around this time also built a lithograph press for his cousin Nathaniel Currier, a lithographer in New York City. His blacksmith shop, foundry and machine shop enterprise, occupied an establishment at Commerce Street 23 and New Jersey Railroad Avenue, now Railroad Place. The firm name was changed in the ensuing years; from Currier, Davis and Jacobus, to Currier and Jacobus, to Currier and Sanford, to Cyrus Currier , and finally Cyrus Currier and Sons. With the foresight that makes for ultimate success, Cyrus Currier inculcated to his sons, Osceola, Cyrus, and Francis, the principles of his business and manufacturing method so that they might carry on a tradition that he was fast erecting. He had built a large lathe for finishing paper mill dryers, which he finished personally, chipping and filing it by hand; no mean mechanical feat. The first transfer press for printing United States paper currency was a product of his shop. The early equipment and engines for drawbridges were also from the plant of Cyrus Currier. In inventive fields he perfected numerous original attachments for leather manufacturing and finishing machinery, a fitting endeavor for a member of the Currier family. During the years of a long and successful commercial life, Cyrus Currier maintained intimate friendships with both his cousin Nathaniel Currier of Currier & Ives notoriety, his former employer Seth Boyden, and inventor Thomas A. Edison, the Edison Laboratories being a regular customer of the Currier firm. Cyrus Currier resided in the Roseville section of Newark, settling there when it was a suburb of the thriving city of which it is now a part. At the time of his death Mr. Currier resided at No. 566 Warren Street. Died, at Newark, New Jersey, December 6, 1892 Married, first, in Lowell, Massachusetts, October 2, 1836, Nancy Maria Roper who died at Newark, New Jersey, October 28, 1853. Married, second, in Newark, New Jersey, April 26, 1857, Charlotte Axford, who died at Newark, New Jersey, September 25, 1902. Cyrus Currier & Sons, Machinists and Founders, Office No. 21 Railroad Place. — Forty years ago this eminent and extensive representative firm laid the foundation of their present enterprise and are now one of the leading houses engaged in their line of the manufacturing industries of Newark. The extensive premises occupied comprise a large three-story brick building, containing machine shop, 75x100 feet; blacksmith shop, 25x30 feet; foundry, 75x80 feet, and pattern shop on top floor. The establishment is fitted with the best machinery, designed by the firm for the requirements of the trade, which is operated by a steam engine of fifty-horse power, and there are one hundred skilled hands in the various departments. The capacity of the foundry is five tons of metal for castings per day. The products of the works are steam-engines, smelting furnaces, elevators, transfer presses, which are chiefly shipped to England and Mexico ; embossing machines, shafting, gearing, pulleys, machinery for the manufacture of enameled cloths, for leather manufacturers, jewelers, saw-mills, grist mills, and especially for paper mills. An immense trade is done over the United States and in Europe, the sales being estimated at $ 150.000 per annum. The firm are sole manufacturers of Kingsland's patent beating engine, chilled iron rolls, etc. The individual members of the firm are Cyrus Currier, a native of Massachusetts, who in 1835 went to work at machinery and is a self-made man, and his sons, Osceola and Cyrus C, both being natives of New Jersey. 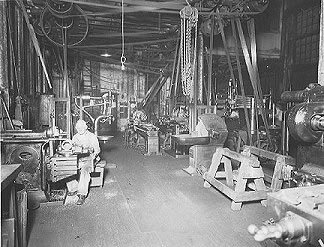 All are thorough, experienced and practical machinists, having devoted their lives to the development of the business, and are now among the most prominent of Newark's citizens.